The number of Viditel users did not grow fast. Yet in order for videotext to become a success, a fast expansion was needed. One way to reach this was by cable. The Netherlands had already a high density with cable and could function as a new distribution net. The first idea was to have a two way cable network to distribute videotext services. But in order to do so networks had to be upgraded. In the South of the Netherlands, called South Limburg, there were few networks; so that would be an ideal area to start the innovation. On March 12, 1982 the government decided in favour of an interactive two-way cable net for television, information services, video-on-demand and alert services. With 90.000 households in the area Totaalnet was started. It took some time before the project got on its way. Finances were a problem and companies like VNU, Publimedia (Yellow Pages), Delta Lloyd and AMRO Bank were asked to put in money along with the grants of the government. But the technology was not refined either. Most of the 59 million guilders (27,5 million euro) went into the infrastructure and technology. Kerkrade was the only city that got two-way interactive cable. Maastricht and Heerlen were left with a hybrid system. The South Limburg project as become similar to a technology driven project with hardly any attention for the development of services. As the government was one of the main sponsors of the project you would have expected an official investigation why the project did not succeed. Gustaaf van Ditshuijzen (left photograph, most left) at a Ditzitel presentation and a brochure (right). Compliments of Gustaaf Ditshuijzen. The hybrid system was a development of VNU New Media department. Engineer Gustaaf van Ditzhuijzen discovered that the DMF tones of a push button telephones could be used for identification of the subscriber and as input for the videotex computer, while the cable could be used for distribution of the requested pages. Fred Kappetijn was the promoter of the system; his main argument was that investments had to be made in the infrastructure and not at the subscribers’ end. 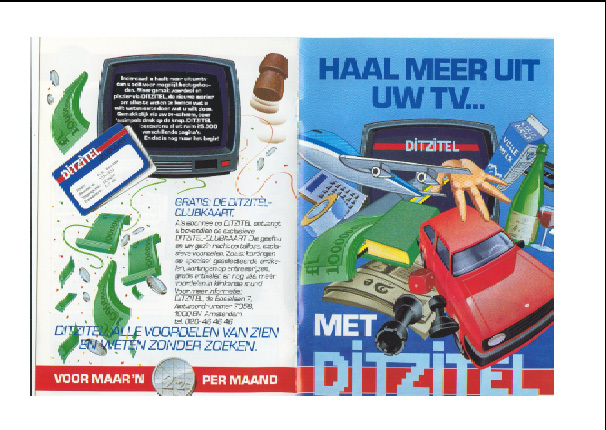 No less than 10.000 cable net subscribers in Amsterdam with a television and a push button telephone were potentially subscribers to the Ditzitel service. And the subscription price of 2,50 guilders (1 euro) a month could hardly be a problem. But Ditzitel did also experience problems. The launch would be in September 1986, but was postponed to March 20, 1987. But on that day the service was neither launched. Software problems with the identification, the lacklustre interest of the consumers, advertisers and information providers did VNU decide to cut the project and write off 23 million guilders (10 million euro). It took VNU more than 10 years before investing again in information services, this time in Internet. VNU had written off the hybrid videotext technology as not stable. 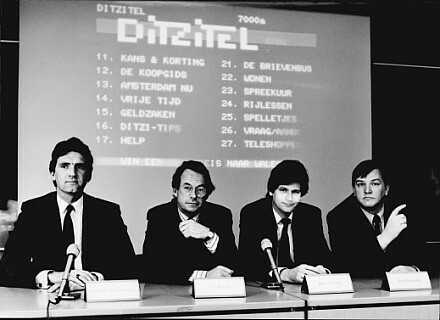 Yet by 1988 the hybrid technology worked and was introduced as Rits services on various cable networks, amongst others as Thuisinfo service on the in The Hague. In 1994 Thuisinfo used the hybrid principle for selecting by telephone and distributing internet by cable. Bestel nu het boek voor 18,00 euro incl. BTW en verzending. Jak Boumans (1945) is principal consultant with Electronic Media Reporting, a private consultancy specialised in content strategy, based in Almere (The Netherlands). In 1970 he started in the publishing industry with companies like VNU and Kluwer, particularly in general encyclopaedias. From 1980 he got involved in electronic publishing, running a videotex studio. In 1984 he launched a daily online newsletter for the computer industry from London. In 1987 he was part of the production team that produced the first Dutch subscription CD-ROM for Kluwer for lawyers. In 1990 he started the private company Electronic Media Reporting, a consultancy specialised in content. He worked for international organisation ( European Commission, OESO), Dutch ministries, national organisations and companies. He is secretary-general of the European Academy of Digital Media (EADiM) and board member of the multimedia competition World Summit Award (WSA). He has written for national and international magazines. He was contributor, editor and editor-in-chief of Telecombrief (1981-2004). He wrote, contributed to and co-edited books. His last book in Dutch was on Pre-internet in de polder (1967-1997). Where is Jan Timmer now that DVD needs him?